We want our workshops to be open to everyone, so please email dsflfirsttimers@gmail.com if the ticket price is prohibitive - or if you have any specific access needs you want to discuss - and we’ll do what we can to make sure you can attend! - What is Mindfulness and how can it benefit me? This workshop will be 90% practical and only 10% theory with the aim of you leaving with a felt experience of what mindfulness is and how you can practice it at home. There is no need to have any prior knowledge or experience of mindfulness or meditation however this workshop will also be suitable if you already have a regular meditation practice. There will be regular breaks and a chance to chat to the teacher after the workshop. This will be a relaxed environment with no pressure to take part in any meditations or activities. 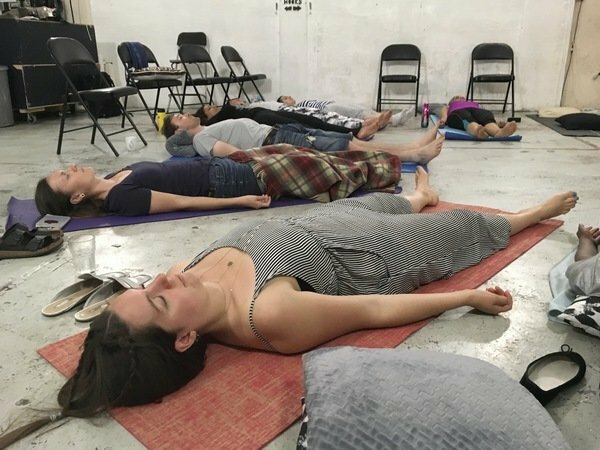 Deena from AYAM (Accessible Yoga and Mindfulness) developed a daily yoga and mindfulness practice after developing chronic migraines & fibromyalgia as a disability in 2012. These practices have enabled her to manage chronic pain, stress, anxiety and stage fright (she is also a drummer in Best Praxis, First Timers 2017). Deena has since trained as a yoga teacher with Yoga Monks and a mindfulness teacher with Zenways. Her commitment is to make yoga and mindfulness accessible to everyone. You can come just as you are with warm and comfortable clothes or you can bring any of the following; yoga mat, meditation cushion (or an ordinary cushion) and a blanket. Please let me know if you would like to borrow a yoga mat.